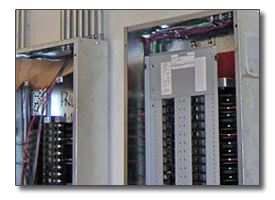 Radtke-Reuter Electric LLC specializes in Industrial, Commercial and Residential electrical contracting. We offer installation of UL listed control panels, underground and overhead medium voltage electrical work, metering, fusing and distribution. We also offer Thermal Imaging, Power Factor Metering and Power Factor correction with variable frequency drives, soft starts and capacitor installation to increase your facilities energy efficiency. From the large to the small, our goal is provide you with satisfaction in your building or remodeling needs. Our primary service area is within a 75 mile radius of Shawano. If you are building or remodeling your business or home around Shawano Wisconsin give us a call so we may provide the electrical services you need. From telephone lines to Cat.6 or Fiber Optic and interduct, our installations within your building or facility are complete with in house testing equipment to ensure cable and terminations meet your specifications. 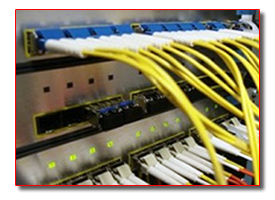 Whether wireless or cabling systems are required, we can provide the service necessary to get the job done. Radtke-Reuter Electric carries AA, AAA, C, D, 9V in regular or Lithium. We also stock the most popular batteries for cellphones, watches, cameras and work tools. We carry Ray-O-Vac work tool batteries that are equivalent to DeWalt, Makita, Panasonic, Black and Decker and Milwaukee Tool batteries. 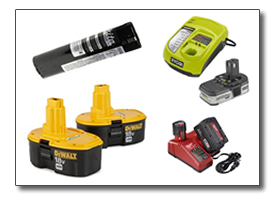 Drop off your work tool batteries for a "rebuild" at a fraction of the price of new! Radtke-Reuter Electric is a Wisconsin Focus on Energy Partner for energy efficient lighting projects. The newest energy efficient lighting is LED, and we have a wide selection of LED lighting products available. We stock the Energy Advantage lamps and ballasts that you need to Upgrade or Maintain the lighting fixtures in your facility. Philips T5 and T8 Lamps are environmentally friendly and will reduce your energy costs. 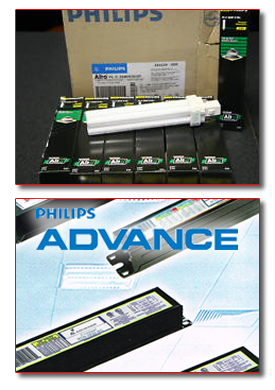 Advance Optanium Ballasts are engineered to optimize lighting performance and maximize Energy Savings. If you are in Shawano and need lamps or ballasts, stop by our store. If layout or design of a new lighting system is needed, Radtke-Reuter Electric can assist you. Bring in your table or floor lamp for repairs or updating. Radtke-Reuter Electric has the equipment to help you. 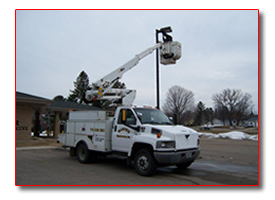 Whether it’s changing light bulbs, replacing fixtures or making sign repairs, we have the Lifts you need, whether it’s a 20’ personnel lift, a 44’ Bucket Truck or an 80’ Snorkel lift. Our lifts come with our personnel to operate them.